Will I need a permit or visa to work in Singapore? As an expat you will need to apply for an Employment Pass from Singapore’s Ministry of Manpower. Is there any paperwork for this that I must complete? The only thing you need to do is apply for the Employment Pass, no other paperwork is necessary. Should I open an offshore bank account or a Singaporean bank account? Any interest you gain on deposits made in Singapore is free from tax, as is any foreign source income, thus banking in Singapore is not really a problem. When does the Singaporean tax year start? Singapore’s tax year begins on 1 January. How is my tax residency determined? If you are an expat travelling to Singapore for work then you will be taxed as a resident if you work or live in Singapore for 183 calendar days or more. Also if you have been in Singapore for three years or more, even if you have spent less than 183 days in your first or last year. Are there any state or regional taxes? Am I able to file a tax return with my partner? If you are married then you will have to file your taxes separately, Singapore does not allow joint tax files. What can I deduct from my tax? 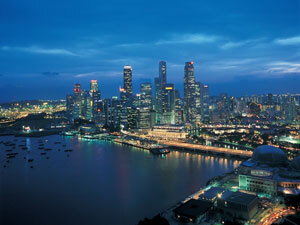 There are a number of forms of tax relief available for residents of Singapore. All taxpaying workers are automatically accorded relief up to $1,000 via earned income relief. Married individuals are allowed to claim wife relief up to $2,000 providing the wife does not make more than $2,000 per tax year. Child relief is also claimable, in a number of ways. $2,000 Basic child relief is claimable for any child, $3,500 for handicapped child relief . Single mothers, including widows and divorcees, can claim relief based on their earned income. If you are responsible for your parents then you may also claim parent relief of up to $5,000 or $8,000 if they are handicapped. You can also claim up to $3,500 relief on any courses or studies you have undertaken to further your business, employment, or profession. Is there a chance I could be taxed in my home country too? Singapore is usually free from all forms of double tax. Will I have to file a tax return? If so, when? Yes, providing you make over $22,000 a year you will have to fill out a tax return and file it by 15 April. If you require an extension then you must apply via the Inland Revenue Authority of Singapore by 31 March at the latest. Extension requests are judged on their individual circumstances. How do I pay the owed tax? You can pay your yearly tax bill either in a lump sum or through monthly instalments into the Singapore GIRO Payment Scheme. Any income, even if it is in the form of employer provided housing, is taxable to its value. Will I be taxed in Singapore on income generated back home? No, any foreign source income earned is free from Singaporean taxation. What other investments are free from tax? Interest earned from deposits made into Singaporean finance companies or banks is free from tax, as is income from structured financial products and income from unit trusts, and real estate investment trusts. Also note that Singapore has no capital gains tax. Are there any other taxes I should know about? Singapore has property taxes in place that must be paid on any immovable property you may own including offices, houses, apartments, factories and shops. Property tax is calculated by a percentage of the property’s gross annual value. Property tax is levied at four percent for owner-occupied residences and 10 percent for anything else. Will I have to pay Social Security in Singapore? As a foreign employee you will not have to pay contributions to the Central Provident Fund, however if you evolve into a citizen you and your employer will have to do so.